Ok, so this might get confusing. First of all, there’s a traditional hierarchy of genres in Western art history, and genre painting is actually one of those genres, even though it’s called “genre painting” which kind of makes no sense. Wait, let me back up: genres, a.k.a. categories, in Western art history are not styles (like Impressionism, Pop Art, Realism) but are instead about the types of scenes that are being painted (portrait, landscape, still life). Let me back up again: a “genre painting” is not, as you might think, a painting that fits into any one of these genres; instead, a genre painting is a type of scene and is therefore “a genre” in itself. Let’s see if we can make sense of this. History painting and allegorical, religious and mythological scenes. 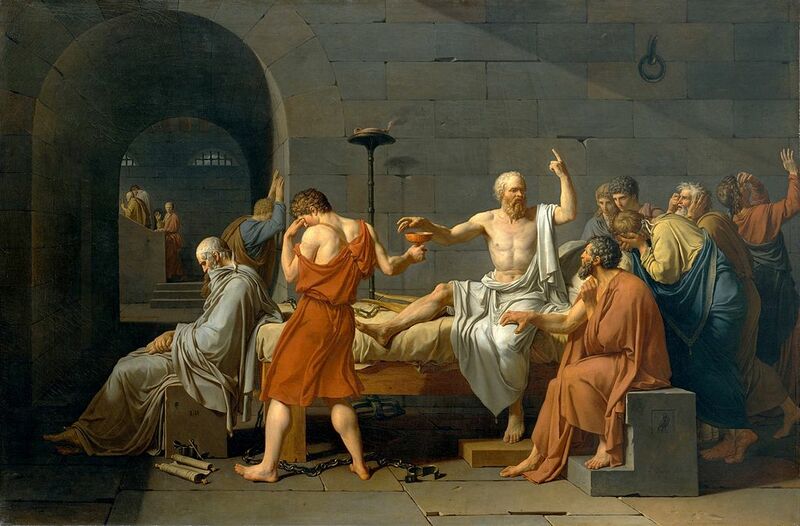 History painting, which was unequivocally the most prestigious genre of painting until the mid-19th century, basically refers to scenes of important historical, allegorical, mythological and religious events and narratives. History painting had a certain style: it had to be big, it had to be momentous, and it had to be theatrical. It had to both tell a story and reflect the importance of that story. 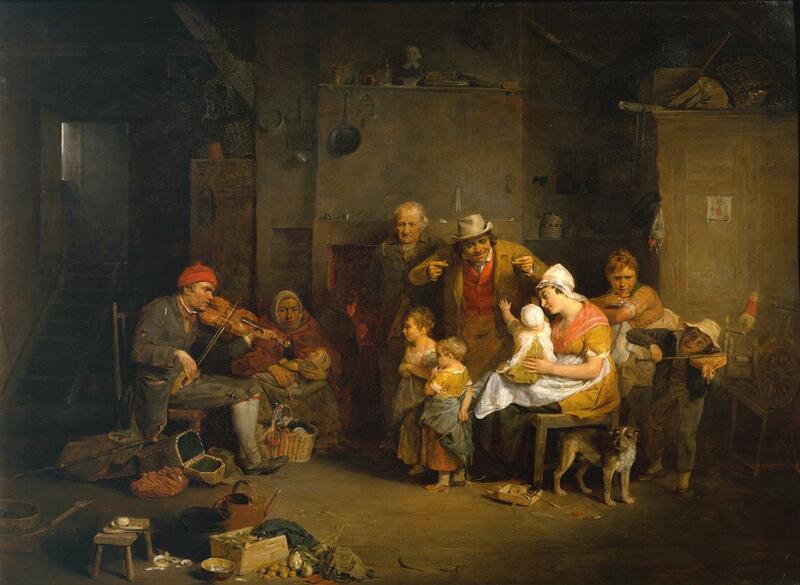 In contrast to history painting, genre painting refers to scenes that depict everyday life. Keep in mind that scenes of everyday life have been painted throughout art history and across the globe, with examples appearing everywhere from Ancient Egypt to 17th century Japan. However, I’m talking about a specific Western genre tradition, to which the term ‘genre scenes’ (or scenes du genre) has been applied. This tradition mainly grew out of 17th century Dutch Golden Age painting (although there was no Dutch term for “genre painting”, which comes from French) and spread across Europe from the 17th century onwards. By the 19th century, genre scenes were commonplace. You’ll notice that I haven’t included genre painting in Félibien’s hierarchy of the genres. 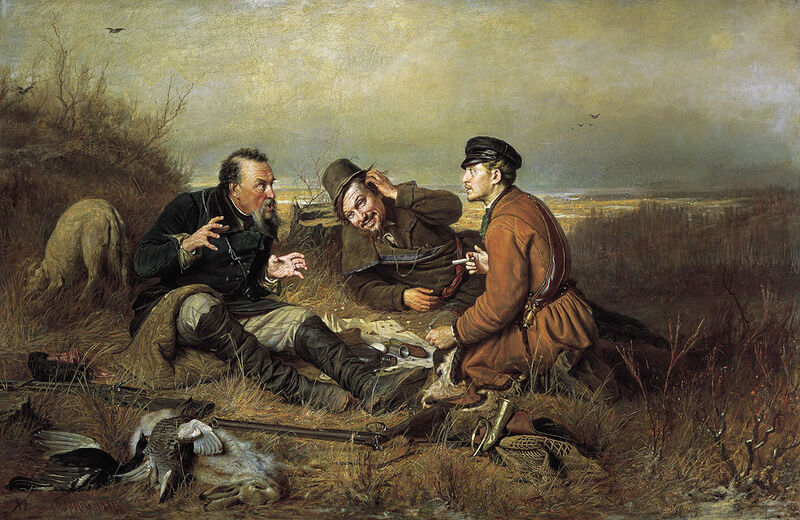 Some art historians do (because Félibien wrote that depictions of humans are always the most important), but the reason I don’t is – firstly – because Félibien did not specifically allude to genre painting as a separate category, and – secondly – because genre painting was never really accurately defined and has remained a source of semantic confusion for centuries. It never fit comfortably into the genre hierarchy. So, why is genre painting called “genre painting”? Well, we don’t have a clear reason, but the answer could lie in the very ambiguity of the term. Art historian Susan Siegfried, for example, suggests that genre painting was an unstable category that didn’t fit in with any of the other genres, and so was simply relegated to the default category of “genre”. Watelet and Diderot’s quotes that I just mentioned also show that, quite often, genre painting basically referred to anything that’s not history painting or portraiture, simply grouping together all of the lesser genres. Art historians who study genre painting, then, have to allow for a much wider definition for genre painting than we might have previously thought. Genre painting should perhaps be looked at as the rise of a wider interest in contemporary daily life, influencing Western art as a whole. By looking at some classic genre paintings, we can get a better idea of what genre painting is (or what it is not). I’m especially interested here in showing you some hybrid paintings – paintings that can be defined both as genre paintings and NOT as genre paintings. To start off, I’m going to show you a scene that is pretty universally agreed to belong to the category of genre painting. Johannes Vermeer is perhaps the most famous genre painter of all time, specializing in domestic interior scenes of middle-class life. 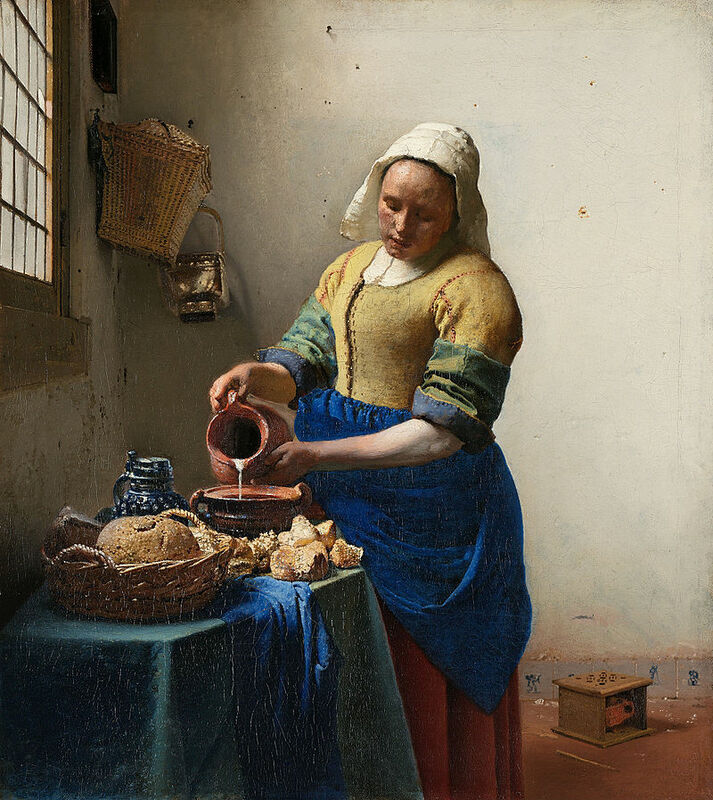 The milkmaid (1657 – 58) is one of his most well-known works. Vermeer painted in the Dutch Golden Age, which was arguably when Western genre painting was popularized. He is famous for the sense of stillness and quiet monumentality that he brings to his subjects, often featuring people (especially women) at work alone in a room. Jean-Baptiste Greuze is a very interesting example of a genre painter. His genre scenes became incredibly popular due to the way he combined them with aspects of history painting. His genre scenes were monumental, theatric and moralizing, with figures lined up as if on a stage rather than appearing as a naturalistic snapshot. 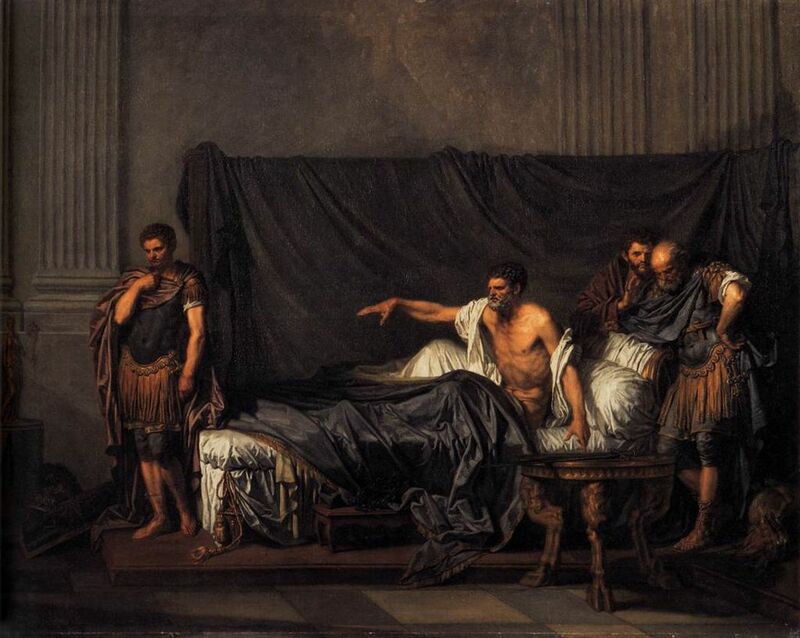 However, when he submitted the history painting Septime Sévère et Caracalla to the French Académie in 1769, it was rejected for being too much of a genre painting. This is despite the fact that the subject matter was from ancient Rome, depicting the emperor Septimus Severus reproaching his son Caracalla for trying to kill him. Academician Charles-Nicolas Cochin, for example, criticized the painting by saying that Greuze has given his subjects “the traits of simple and common people”. 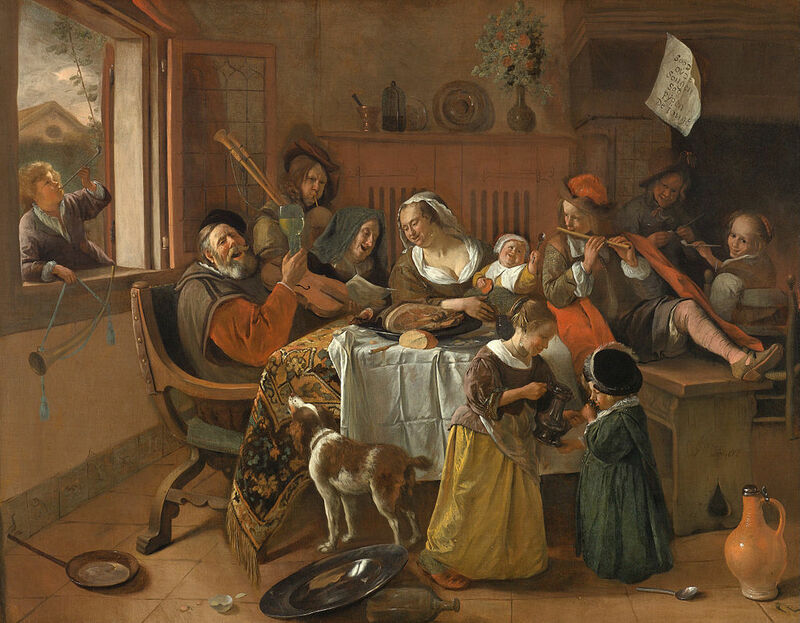 This lets us know that genre painting was about more than just subject matter, and seems to have been partly about depicting people in a more naturalistic way. Jean-Siméon Chardin was a still life, portrait and genre painter, and he often mixed elements of those genres together. He was famous for his incredibly detailed, realistic and carefully painted works. He was a dedicated academician, but engravings of his genre scenes allowed his work to be reproduced and spread to the wider masses. Chardin’s mixing of the genres is especially noticeable in his portraits, in which his subjects would often be pictured in the middle of an activity, not looking at the viewer. 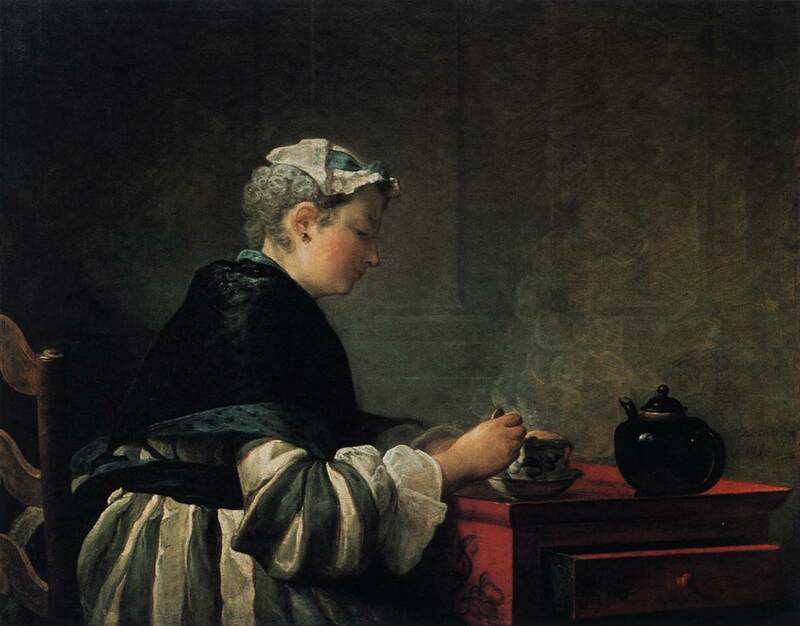 The title of A lady taking tea, for example, suggests more of a “type” of person (or a “type” of domestic scene) rather than an individualized portrait. 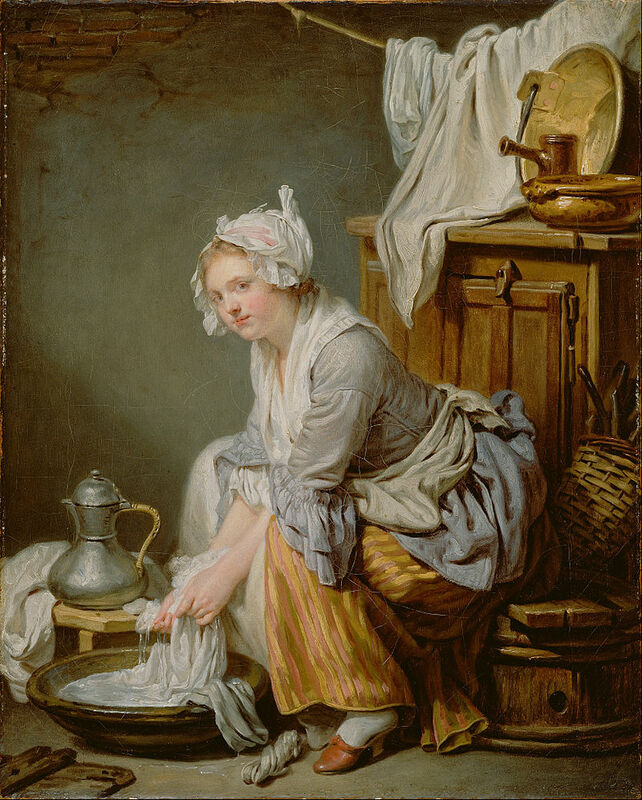 (The sitter was probably Chardin’s wife, Marguerite Saintard.) It begs the question – where is the line drawn between genre painting and portrait? By the end of the 19th century, scenes of everyday contemporary life became the norm and “genre scenes” were no longer relegated to the margins. Although the term is still used, especially when referring to paintings from the 16th – 19th centuries, its meaning has always been hard to define. In my opinion, however, it’s the very ambiguity and hybridity of genre painting that makes it so interesting and important. The clean delineation of the genre hierarchy never really worked, and the history of genre painting proves that. Artist Feature: Who is Xiao Lu? Thank you for another excellent post! The popularization of genre painting also correlates with the Protestant Reformation, with their love for text, and a mistrust for the visual imagery that was so popular in the Catholic church. Artists in the north were not receiving commissions or supported by wealthy patrons to the same extent. So they painted for the community rather than a hierarchy. Maybe this is where the term “starving artist” began? I keep thinking about the pros and cons of either side. How some of my classical painter friends work largely from commissions, and how otherwise we view the role of an artist today as someone who creates change and is a conceptual magician of sorts. How the artist as a free agent changed society entirely, and created the world we live in today through creativity, science, technology, etc. Anyway, I’m writing a chapter on this, and your post really correlates with my train of thought. Where does the denomination “scène de genre” (with an accenrt grave on the first e and “de” instead of “du”) comes from? My guess, as a French native speaker, is that “scène de genre” (or”peinture de genre” is shortening of “scène de genre bas” (or “peinture de genre bas”) whith “bas” meaning “inferior” or “scène de genre vulgaire” (ou “peinture de genre vulgaire”) whith “vulgaire” meaning as in its Latin root “common” (but not “vulgar”). The qualifiers “bas” and “vulgaire” must have been left out when this genre was no longer consider “inferior” or “common”. Hi Kevin – sure thing, as long as you give full credit you’re of course free to link to the article on your website! 🙂 So glad you found it useful! really informative. I appreciate you taking the time and energy to put this information together.